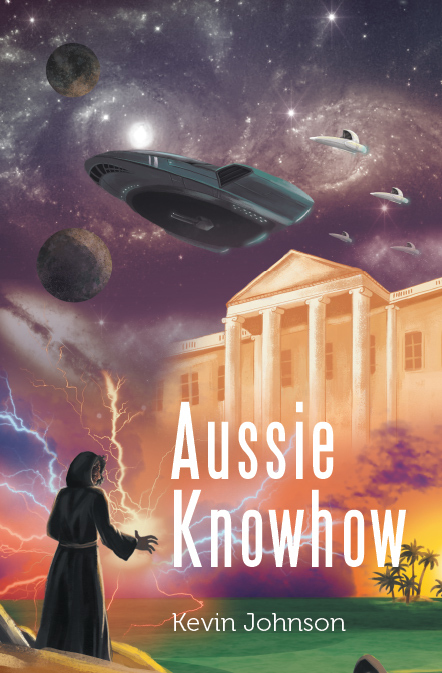 Aussie Knowhow is the sequel of Aussie Pilot and continues the events affecting the hero, his friends, and their children. This book enters the world of believable science fiction and joins modern day and ancient magic practices to solve past catastrophes. Since his second marriage to a witch, David Granger and the discovered computer Orack, set about correcting some past disasters whilst also continuing to work as a consultant to the USA president. Their attempts to negotiate peace in Afghanistan and the Middle East are affected. They discover that the bombings, many of the world disasters and serious conflicts are created by business moguls and that the world is being manipulated by blackmail to gain massive wealth, eventually stretching as far as neighbouring recently discovered planets. The use of magic and illusions helps to abate imminent disaster. Space travel with several confrontations occur and the computer Orack, the Granger family and some of their friends find themselves facing adventure and near-death circumstances. This book ends with the defeat of the supreme commander and the saving of the planets Earth, Atlantis, Genesis and Dudgeon from economic collapse. Our hero considers retirement leaving the way open for his families continued concern for the survival of the worlds as we know them. A third book, Aussie Impasse, concludes the families fight for world peace, where our heroes’ children become a serious force.